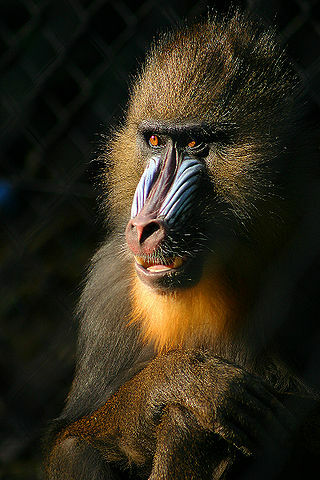 English: Mandrill (Mandrillus sphinx), looks almost human despite the colorful face. Français: Mandrill (Mandrillus sphinx), qui a l'air presque humain malgré son visage coloré. Gaeilge: Maindrill (Mandrillus sphinx). Tá cuma an-chosúil le daoine ar an ngné seo d'ainneoin a aghaidh daite. Galego: Fotografía dun Mandril (Mandrillus sphinx) na que se aprecia o colorido da cara. Tierpark Hagenbeck, Alemaña. Novembro 2005. Italiano: Un Mandrillo (Mandrillus sphinx), ha un aspetto umano nonostante il caratteristico viso colorato. Polski: Mandryl (Mandrillus sphinx), wyglądający prawie jak człowiek nie licząc kolorowej twarzy. Dansk: Mandril (Mandrillus sphinx). Primaten ser næsten menneskelig ud trods de stærke farver i ansigtet. فارسی: مَندریل یا شاه‌بابون؛ نوعی بوزینهٔ درشت‌اندام آفریقایی. English: Mandrill (Mandrillus sphinx). The primate looks almost human despite the colorful face. The soft morning light through the last yellow foliage on the trees, and zoom made it possible to take this photo despite the ugly iron cage that I had to work around to picture this beautiful primate. Tierpark Hagenbeck, Germany. Français : Mandril (Mandrillus sphinx). Le primate semble humain malgrès sa face colorée. Polski: Mandryl (Mandrillus sphinx). Naczelny wygląda prawie jak człowiek nie licząc kolorowej twarzy.